Hooray! The holidays are almost here! We love the holidays so much and we know you do too. The holidays are a time for celebration, good food, family and fun! The holidays are a lot of work too. Hosting dinners and guests requires planning and cleaning. And holiday carpet cleaning too! Your holiday checklist is already long but we recommend including one more “to-do” to it. Be sure to schedule carpet cleaning Fort Wayne before your guests arrive! You want your home to be absolutely beautiful when the doorbell rings and family and friends come into your home. This is even more true if any of your guests are staying for an extended period of time. You will want their guest bedroom to be 100% clean and comfortable for them and that includes the carpet too. Be sure to hire a Fort Wayne carpet cleaner that uses a low-moisture process. You don’t want wet carpet when your guests arrive. Hire a service that doesn’t use chemicals or toxins. You don’t want any fumes or toxins in your home when guests are there. You should welcome them to a clean and healthy home. Check to see if the carpet cleaning company offers carpet cleaning safe for babies and pets. You don’t want to have to discourage guests from bring their pets and you definitely want them to be comfortable bringing their newborn or toddler to your home. Schedule early. The holidays are very popular for carpet cleaning and companies will not have openings for long. You might want to consider fall carpet cleaning to get a jump on the rush. Consider scheduling upholstery cleaning too. You want your furniture to be just as clean as your carpet and the rest of your home. By scheduling holiday carpet cleaning you can be sure your home will be pristine for your guests. This will also help you remember to schedule deep cleaning each year if you associate the service with the holidays. Chem-Dry of Fort Wayne uses very little water for carpet cleaning and we don’t use toxins or chemicals. We use a carbonated solution and equipment that are safe for babies and pets and all of your holiday guests! You can schedule your carpet cleaning close to the holidays because with our service your carpet will dry very fast! Your carpet will be dry in just a couple of hours. 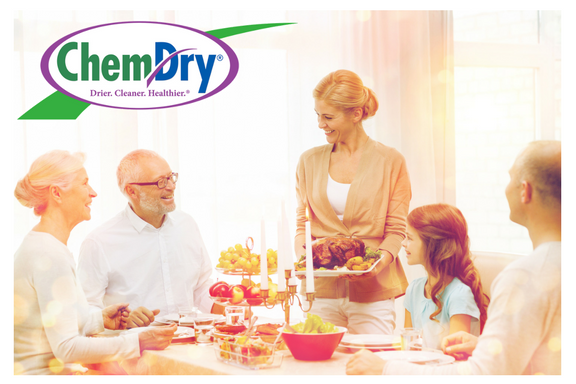 Check “carpet cleaning” of your holiday “to-do” list and call Chem-Dry of Fort Wayne today at (260) 409-1138.